The sign on the wall, partly hidden by some plants, said “Warning: Vandal Proofed.” Jimmy, a dab hand with a spray-paint can if ever there was one, took the sign as an affront—perhaps even a personal challenge. “Oh, give me a break. 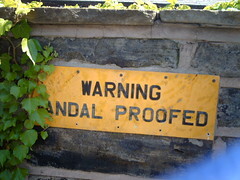 ‘Vandal proofed’? I’ll show them vandal proofed.” And he was over the wall just like that. I finally worked up the nerve to glance over the wall. There was Jimmy’s spray can sitting there out in the open—but no Jimmy anywhere in sight. No sign of blood or a struggle or anything like that—but no Jimmy either. I never saw him again, nor did anyone else I talked to. Since then, I’ve made a habit of paying more attention to warning signs. You just never know. Hmmm. Not as great as the other ones I have read today. But not bad either. Maybe I don’t like it as much because it ends. : D You’re a great writer. I enjoy reading your work. Keep up the great creativity.